Reduces single-wall stovepipe clearance to 6"
When installing a stove to heat your home, sometimes safety regulations restrict your options for stove placement. By installing this stovepipe shield, the required clearance to combustibles for a single-wall stove pipe is reduced to 6 inches, so you have more options in where you can safely install your stove. This shield attaches securely to the stove pipe and comes with the necessary ceramic spacers and screws for proper installation. A black finish matches most stove exteriors and stove pipe and has a more refined look than the typical metal finish. This stovepipe shield is also adjustable to fit pipes from 5 to 8 inches in diameter. Choose this stovepipe shield for safety and flexibility in stove installation. How does it attach to the pipe? Do the screws penetrate the pipe it's being attached to? Also, can this be used on a 6" reducer? Yes the three screws would penetrate the single wall pipe, it has build in spaces to keep the shield at the proper distance. They will work on pipe from 5" diameter to 8" diameter and can be affixed to a reduced/increased section. Can this shield be used on double wall pipe? My stove is installed with the minimum clearance but I'd like to reduce the heat even a little bit further from that point of the wall. I'm certain it could be used in this fashion, but as you may know, this would not be necessary and the product has not been tested in this fashion. I would like to note that you may be doing more harm than good as this may render the warranty with your double wall stovepipe void. If the minimum clearances are already met with the current double wall stovepipe, there should be no risk of damaging the adjacent combustible surface you are wanting to protect. Is this HomeSaver single-wall stovepipe shield U.L. approved? Single wall stovepipe carries no UL listing and installing this shield would simply be an NFPA 211 accepted method of clearance reduction for single wall stovepipe. There are too many variables for a part like this to carry any type of UL listing, which differs from the UL listings commonly found with double wall stovepipe and class A chimney in a wood stove installation. This part would comply specifically with NFPA 211 Section 9.5 Table 9.5.1.2. What is the spacing of this HomeSaver single-wall stovepipe shield? The shield has 1" spacers. Can this be trimmed down? This shield can indeed be cut very carefully with a pair of tin snips. New holes will need to be drilled for attachment of the spacers. Can I install a heat shield horizontally? 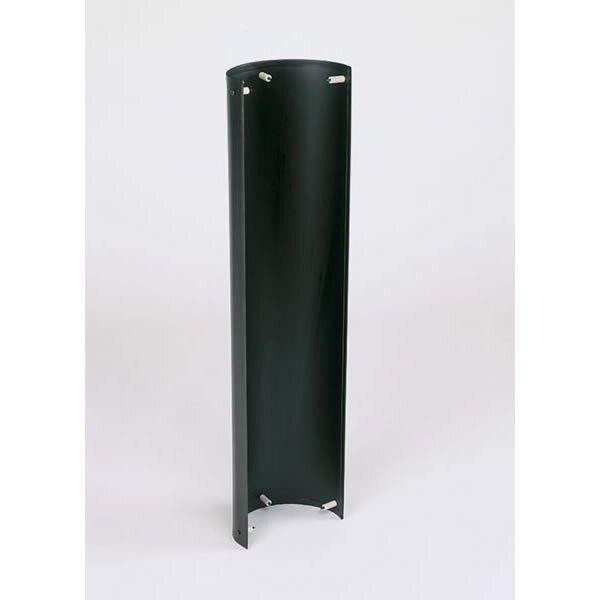 This stovepipe heat shield is only suitable for vertical installations. Using it in a horizontal application will trap the heat between the outer wall of the stovepipe and the heat shield, thus making the ceiling hotter. I had none of the paint issues the other reviewer suffered. The paint was fine. The shield mounted easily and allowed the closer clearances I was shooting for. It probably doesn't add anything aesthetically, but it's a perfectly functional product that worked well for me. Quality construction and materials, very bad quality paint job. This is the second time I've ordered this product and both times the heat shield had a very poor paint job (a lot of drips and running pant, pooling at the bottom and top edges). I needed to repaint anyway since I wanted it flat black, but in order to take care of the drips and runs from the original bad paint job. I guess HomeSaver figures the product won't be seen since it's used to reduce clearances, but it's a bad mark on quality for their company. If you order this product and care what the finish looks like be prepared to do fix the paint job with some sanding and new pant.